Snow-Shod Manor is a large manor in Riften, home of the Snow-Shod clan. 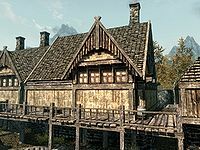 It is located at the northeastern part of Riften, in between Aerin's House and Riftweald Manor. The entrance is kept adept-locked most of the time. Upon entering you are in a large open room with a flight of stairs up on your left, with stairs leading down to the cellar behind and several food barrels and sacks around the stairwell. A long end table against the north wall with a red, a purple and two blue mountain flowers along with a bunch of lavender on top. There is a chair opposite the entrance against the east wall with a wall shelf above holding two bottles of alto wine and a bottle of wine. To the right of the chair is a cupboard and set of shelves that are in the southeast corner. These hold a bunch of lavender, a bottle of Nord mead, a bottle of wine and copies of Rising Threat, Vol. III, Killing - Before You're Killed and Dwemer Inquiries Vol II, an iron mace and a couple of sacks. Against the south wall is an end table that holds a bottle of alto wine with a chair on either side and against the west wall another long end table holding an iron sword and mammoth tusk. There is a doorway in the northeast corner leading through into the dining area with a cooking pot on a stand against the west wall, a cupboard containing only clutter against the north wall and a wooden dining table and benches in the middle of the room. On the table are three salmon steaks, a baked potato, two portions of grilled leeks, a bottle of alto wine, a loaf of bread and an eidar cheese wheel. Hanging from the ceiling are two bunches of elves ear, a garlic braid and a bunch of frost mirriam. To the west is the staircase leading down to the cellar. At the bottom of the stairs, against the south wall is a large pile of firewood and several bales of straw, with a woodcutter's axe leaning against the firewood. To the east is a storage area full of various crates, barrels and sacks. To the north is another storage area with an disused table and chairs, two sets of shelves and a cupboard containing clutter. On the shelves are various pieces of cheese, two cabbages, a load of potatoes and several loaves of bread. To the right of the cupboard is a small round table holding a mead barrel. To the right at the top of the stairs leads to a landing and corridor with a bedroom to the east belonging to Asgeir Snow-Shod, a double bedroom to the west shared by Vulwulf Snow-Shod and his wife, Nura Snow-Shod and at the end of the corridor, by some barrels, sacks and a crate is another bedroom; it would have been their daughter's room, who died after joining the Stormcloaks. 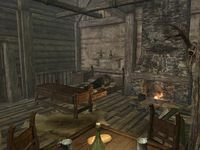 Asgeir's bedroom is L-shaped, long and narrow and consists of a single owned bed against the east wall, with a small low table beside it. On the table is a bottle of wine. To the right is a chair and against the west wall a long end table with an iron sword and shield on top. Opposite the door against the east wall is a wardrobe containing clothes. Lilija's old room consists of a single owned bed against the east wall, with an end table beside it, against the north wall and a wardrobe containing clothes beside that. Against the west wall is an unlocked wooden chest containing minor loot and opposite the door is a long end table with a bunch of lavender on top. The parent's room contains an owned double bed coming out from the south wall with a medium coin purse underneath, an end table to the left and a wall shelf above it. On the end table is a copy of Yellow Book of Riddles and on the shelf are two bottles of wine. At the foot of the bed is a long end table and to the right of the bed is a fireplace. 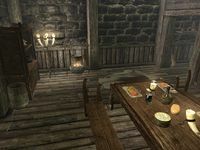 Along the west wall is a pile of firewood while in the northwest corner is a small square wooden table and two chairs, with a loaf of bread and a bottle of wine on top of the table. Against the north wall is a tall wardrobe containing clothes. This page was last modified on 24 March 2017, at 05:38.